Bitter melon is also known as Momordica charantia and grows in tropical climates such as Asia, South America, Africa, parts of the Amazon and the Caribbean. Bitter melon resembles a small cucumber with a warty gourd appearance. Immature bitter melon is green in color, then turns yellow-orange as it ripens. As its name suggests, this tropical fruit has a bitter taste and is used medicinally in many countries. Consult with your health care provider prior to using bitter melon. Indigenous tribes of the Amazon rainforest have been planting and using bitter melon as food and medicine for many years. They add this bitter fruit and its leaves to traditional soup and bean recipes to add bitterness. Furthermore, Amazonians have traditionally used the leaves as a medicinal tea to help treat diabetes, colic and to heal skin sores and wounds. Brazilians, Peruvians and Nicaraguans have also used this plant medicinally to help treat a number of health maladies including malaria, digestive problems, skin conditions and inflammation. Bitter melon fruit contains many different phytochemicals such as proteins and steroids. According to "The Herbal Secrets of the Rainforest," the fruit also contains charantins, alkaloids and peptides, which have the ability to lower blood sugar in your body. Another powerful phytochemical in bitter melon has the ability to inhibit an enzyme called guanylate cyclase. This enzyme may contribute to the growth of psoriasis, leukemia and cancer, so ingesting this power fruit may help prevent some types of cancer. Bitter melon's function of assisting with weight loss is through lowering and maintaining proper blood sugar levels in your body. According to Hello Life, bitter melon can help prevent your body from absorbing excess sugar. Furthermore, it may also increase the number of beta cells in your pancreas, which are involved in the secretion of insulin. Improving your insulin levels can help reduce your blood sugar levels, which makes weight loss easier. You can find bitter melon at most supplement and health food retailers. You will most likely find bitter melon in capsule or tablet form, which you can take one to three times daily. Take this supplement with a full glass of water and follow your health care provider's dosage instructions carefully. 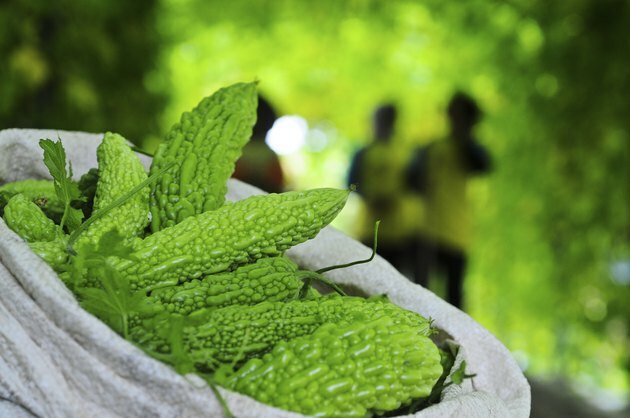 According to "Herbal Secrets of the Rainforest," use caution if you have hypoglycemia or diabetes since bitter melon has an effect on lowering blood sugar. Do not use this supplement if you are pregnant, breastfeeding or trying to become pregnant, since it can cause uterine contractions and may negatively affect your fertility. Consult with your health care practitioner prior to using bitter melon, especially if you have a pre-existing health condition or if you are taking medications. Can You Stimulate Rapid Hair Growth Naturally?